sexually assaulted and no valuables were stolen. So little information on Irene or her murder seems available. This is all I've been able to find. Doesn't even seem to be a picture of her, so far. Perhaps I'll have to see if the Strathroy paper has any more information. And that's it so far. I didn't see anything else within the two weeks following that. I imagine that the police had very little to offer the media after this. Also sad that she had very little connection in her neighbourhood, or any family beyond her brother in Hamilton. As far as a connection with Jacqueline Dunleavy and Frankie Jensen, there's no mention here of the tissue paper. Perhaps the investigators were holding onto that info. The only place I've seen that connection made is in the Toronto Star article reprinted in the Project Angel thread. Except for that, unless the police have more that hasn't been shared publicly, Irene's murder doesn't seem to be related. She was not abducted, but instead found in her own home; she was a senior; and it's said in the article that she was not sexually assaulted. If she shares the same killer as Jacqueline, Frankie, and Donna Awcock, this seems to stand out as an anomaly in the killer's m.o. But again, perhaps the police have not shared all the facts. Just off the top of my head, it is interesting that Irene was receiving "funny" phone calls from an unknown man before her murder. 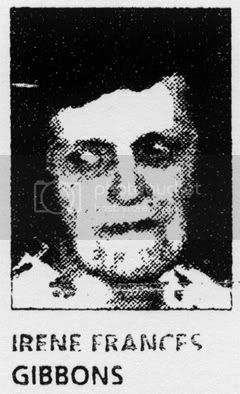 Frankie Jensen's family received calls from an unknown man after he was abducted, and it was noted that Donna Awcock expressed anxiety of impending harm to herself in the days leading up to her murder. Here's the only image I've found so far of Irene, from Feb 5th 1998 LFP Project Angel article. Not sure why it takes that long to get one-- there's nothing in the original 1975 reportage, nor the 1989 re-examination. But I'm grateful there is one (apologies for the poor quality). Thursday morning, 31 July 1975: Shopping day. Irene's friend usually offered her a ride to the grocery store. On this day she was not available. Irene walked to the Foodland by herself. She made use of a grocery delivery service (likely because she had no access to a vehicle). 12:00pm, Thursday, 31 July 1975: Irene arrived home. She spoke to a friend on the phone for a brief time. around 1:00pm, Thursday, 31 July 1975: A delivery boy from the Foodland knocked on the door. There was no answer. The boy left her groceries on the front step. Monday, 3 August 1975: A newspaper delivery girl noticed Irene's groceries still on the stoop. Her dog was howling. The girl called the police who discovered her on the kitchen floor. She had been dead since Thursday. She was lying on her back with nylon stockings and other fabric jammed down her throat. The killer had made handcuffs out of a pair of stockings using elaborate knots. She had been slowly suffocated by a nylon tourniquet tied around her throat. There was no sign of a struggle or obvious sexual assault, but "the home invasion murder of Irene Gibbons has all the markings of a sadistic sexual homicide" (Murder City, 206). Irene lived on Keefer Street. I believe the precise address is listed in one of the newspaper articles, which I cannot access right now, unfortunately. I've looked it up before, and I recall that she lived across the street from what used to be Southdale Public School. It's clear that the killer had been watching Irene for weeks. He was aware of her schedule. He likely noticed that her friend did not pick her up. Since the murder took place in August, was the killer able to watch Irene from Southdale's empty schoolyard? Irene's yard had little landscaping. Her house was in clear view-- visible to the killer. Also, visible to her neighbours. What did they see? Keefer Street is in the middle of a lower middle class/working class neighbourhood. It largely consists of smaller houses and bungalows. It's close to Caradoc and Metcalfe Streets--Strathroy's two main streets. Both are secondary highways. The Foodland was located on Front St, I believe at the current location of The Bargain King, a 20 minute walk from Irene's home. The murder took place in the middle of a weekday. Was this person unemployed? Or a shift worker? Did he know Irene from her former (I think she was retired?) place of work-- a local craft supply factory? Or did he simply notice her? Or did he have the sort of occupation that helped him to hide in plain sight? Did Irene know him? Did she let him into her house? Or did he break in while she was at the store? It was summer--did she leave a window open? What about the dog? Did Irene take the dog with her to Foodland? If not, did the dog bark at the assailant? Or was the dog familiar with him-- either because Irene knew the killer or because the killer had broken into Irene's house before, without her knowing? Did those stockings belong to Irene? What did her neighbours notice? Did they see any strange vehicles in the neighbourhood? Was he a local? Did he travel by bike or foot? In Murder City, Michael Arntfield notes that one of the sexual predators that hung out at Stanley Variety in London was a resident of Strathroy. He describes the person as a "scatologist." Is he referring to telephone scatologia (harassing phone calls)? Any link to the Gibbons case? Who would know how to tie those elaborate knots? I'm thinking of the Golden State Killer suspect. One of the knots that he used was a naval knot. Lo and behold, the current suspect was in the US Navy. Would Irene's killer have had similar training? Christian Magee was active in Strathroy at the same time although his targets were teenage girls, and the MO was very different but in a small town like that he must have been looked at for this murder too. From the description in George Fayne's post it seems very likely that the murderer was in the in the house when the grocery boy knocked and that might have panicked the attacker and maybe why there was no sign of a sexual assault. I agree- no doubt local police considered Magee. One of his victims was attacked in her home, too. I also bet that the local cops struggled with the possibility that Strathroy was home to not one, but maybe two, serial killers. Ultimately, though the cops didn't link Gibbons with Magee. The Magee cases and the Irene Gibbons case have some striking dissimilarities (aside from the obvious age differentiation between Gibbsons and Judith Barksey, Susan Scholes, and Louise Jenner). The Magee murders seem very disorganized: his attacks were sudden and frenzied. The Gibbons case comes across as very organized. Gibbons' killer clearly stalked her for weeks. It seems remarkable to me that he was able to enter and leave her house without any notice. It was summer, in the middle of the day. There would have been children around. I'm drawing from memory here, but I seem to recall that one of the LFP articles showed Gibbons's house-- what struck me was that her yard had very little landscaping, no towering trees or shrubs. She was in clear sight, not only to the killer but to her immediate neighbours (so what did they see, if anything?). To me, this suggests that the killer was familiar with that neighbourhood and the routines of its residents. Maybe because he lived there, maybe because he watched (I'm reminded of the Golden State Killer, here. Obviously, I don't think it's him, but I think there are similarities). Also, the dog would have barked (unless, of course, the dog knew the assailant. either because Irene knew him or, more chillingly, because the killer had broken into her house previously without her knowing). To sum, this all strikes me as extremely methodical, whereas Magee seemed to react to an impulse. Caroline Ida Weldman was 58 years old. She died in September 1963. She lived in a second floor apartment in London with her husband. At the time of the murder, her husband was in the hospital. Her body was discovered in her bed. She was strangled with the sash from her husband's housecoat, which was wrapped around her neck three times. Police believed it was a break and enter gone wrong. Two 17 year old men were charged later that year. Psychiatrists determined that they were mentally ill. One of the assailants was diagnosed with Schizophrenia. The other was sent to Ontario Hospital in Penetanguishine for an indefinite period of time. It seems his accomplice was also sent to a mental health facility-- I'm not sure where and for how long. One of the men may have lived in the Niagara region under an alias. This person (if it is the same person, and I think it is) was murdered in 1979. He was not in the hospital at this time. Coincidentally, Caroline Weldman was Jacqueline Dunleavy's aunt. Jacqueline's death is often linked to Irene's. Her killers kept tabs on her. They happened to strike when her husband was in the hospital. Was anything found stolen from Weldman's apartment? Police determined that this was a B&E that had been interrupted, and yet, strangulation seems such an extreme response to this situation. At this time, police were not necessarily trained to recognize paraphillic behaviours as such. Weldman was discovered in bed. This detail sticks out to me. One of the assailants may have been living in the Niagara region in the late 1970s. So, (if this is the person) clearly he was not institutionalized long term. From the Zurich Citizen News (11 October 1973): Links here and here. Police are still looking for some type of evidence which might give them a lead in the strangling death of a 93 year-old Hensall widow, found in her home last Friday afternoon. Mrs. Jane McMurtrie was found naked in her upstairs bedroom by neighbours. She had been last seen by neighbours raking leaves on her front lawn Thursday afternoon. Her home is on the main street of Hensall near the westerly limits of the village. Mrs. Fred Vivian who made Mrs. McMurtrie one main meal a day, brought her groceries and helped with some housework, said he [sic] went to the house at 1:20 pm Friday and found the rear door unlocked. She said she was suspicious, went next door and attempted to telephone Mrs. McMurtrie but found the telephone was no working. Police said the telephone line at the victim's house had been cut, but added that workmen had been repairing the line earlier in the week. Insp. Tom Lennon of the OPP criminal investigation branch in Toronto said the cause of Mrs. McMurtrie's death was not immediately apparent. There were no external signs of violence. An autopsy Saturday at Stratford General Hospital revealed the strangulation. Police said forensic laboratory experts are trying to determine if she was sexually assaulted. Insp. Lennon said there were signs of attempted entry in two locations at the large tree-shaded frame house where Mrs. McMurtrie had lived for 35 years. Police called in from Sebringville and Goderich to assist the Exeter OPP detachment made [sic] a house-to-house canvass Sunday and Monday to determine if anyone had seen anything that could be of assistance. Police and the victim's niece, Mrs. Stewart Bell of Zurich Road, described Mrs. McMurtrie as "in good health for her age." Mrs. Bell said her aunt was able to do many chores in the house and around the yard although she couldn't walk well. She was "a good church goer and a good giver," Mrs. Bell said. Mrs. McMurtrie had lived along [sic] for 11 years since the death of her second husband. She had moved to the King Street house after the death of her first husband, a farmer. "She had no family, no children," Mrs. Bell said. "She had those two cats--they were barn cats--and they were her children. She called them her children." Mrs. Bell took the cats home. Police said the house was not ransacked, nothing was taken, and there was no apparent motive for the killing. It was the third slaying involving elderly women who lived alone in this area in the past three years. A 70 year-old Clinton woman was stabbed to death in January 1970, and a 76 year-old Crediton woman was beaten to death in November of the same year. Funeral service for the late Mrs. McMurtrie was held Monday at Bonthron Funeral Chapel, Hensall, with internment in Baird's Cemetery. Rev. Donald Beck officiated. Jane's home differed from Irene's: it was a large, second story farm house with a substantial yard, shaded by trees. Both Jane and Irene's residences were in a residential area in a small town. Jane lived on a main street--King Street (county road 84). two other elderly women were murdered in their homes in this region: the stabbing victim was a retired school teacher named Katharine Macgregor. I can't find information on the other victim. Hi George Fayne, welcome to Unsolved Canada, and thank you for your input. Ignoring Irene for a moment, if we look at your research, whereby three older women were murdered in their homes, all within three years, and all located minutes from Hwy. 4, and within a half an hour of each other--how fast can one say "serial killer". This is unbelievable. I have never heard of these cases. Now add Irene, and we have four older women murdered in their homes, within five years, and all located within sixty-nine minutes of each other. (Strathroy is about 15 minutes off hwy. 4). The distance from London to the farthest town is only 85 km. It should be noted that the time period of these older womens' murders (1970-1975) was during the heyday of London serial killers, and which has been described as the serial capital of the world by M. Arntfield, in his book about London, "Murder City". The record of OPP historical, unsolved murder cases is worse than I thought. The "Highway Four" connection is something, eh? I've read that organized killers often have access to a vehicle and usually have stable jobs. I've wondered if Irene (and maybe Jane's?) killers were brought to Strathroy (and Hensall) because of their work. Anyways, I really can't say whether or not these cases are related-- I feel like more information is needed. Whether or not these cases are linked, it seems like Irene, Jane, Katharine, and this other victim who I haven't been able to identify, were not given the same attention as other victims from that era. Perhaps because people feel a stronger sense of protectiveness towards younger victims? Maybe, because people had (have) a hard time dealing with the fact that these murders (Jane's and Irene's at least) were sexually motivated? At any rate, I have a feeling if we look closer there's a good chance we can uncover similar crimes throughout rural Southern Ontario--crimes that have been swept under the rug. The article says it was third slaying of an elderly woman but does not say they were all unsolved.